Here is my quick list of tips for growing great tulips. Tip #1 – Tulips need well-drained soil. Make sure your soil has suitable draining capabilities and if it doesn’t, amend it with compost or peat moss. Tip #2 – In USDA Zones (6-7), plant tulips from October through November. In colder USDA zones (4-5) plant from September through October and in warmer zones (8-9) November through December. Plant in zone 10, December through early January. Note that in zones 8-10 you must refrigerate the bulbs for six to eight weeks to give them an artificial “cold time” before planting outside. Tip #3 – Once ready to plant tulips, dig holes 6 – 8 inches deep. Do this when the soil temperature is cool – 60°F or cooler and contains a moderate amount of moisture. The soil should be moist and able to make a ball if you squeeze it but otherwise crumbly and loose. Do not plant tulips in very wet, lumpy soil! If pests such as voles are a problem in your area, plant tulips 8 inches deep, meaning 6 inches of soil covers the bulb. This will help them stay out of the reach of voles. Tip #4 – Once the hole is dug mix a little (1 – 2 tablespoons) of organic bone meal into the bottom of the hole along with a small amount of peat moss or compost. Place the bulb pointed end up in the hole and cover with amended soil. 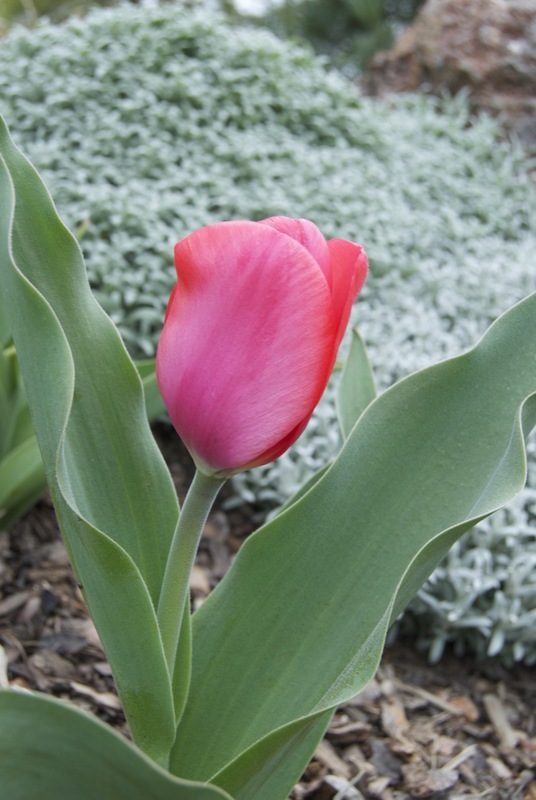 Tip #5 – Over the years I have decided the most successful place to plant tulips is nearby and around shrubs/trees. The soil around these garden elements is usually not disturbed when working in the Spring and is refreshed with compost and mulch that is put around trees/shrubs each year. Additionally, once the tulips have bloomed shrubs are filling out and cover the yellowing leaves of tulips. When planting a grouping of tulips if you want them to all bloom at the same time, be sure to plant at exactly the same depth; this helps them bloom at the same time. With a shovel, dig out soil of an area to create a level planting base. Set bulbs into the planting bed, fertilize and then cover with excavated/amended soil. Tip #6 – In cold winter areas (zones 3-6), apply mulch a week or so after planting. Once soil is settled, spread mulch to protect the bulbs. In mild-winter areas mulch after planting to help keep soil as cool as possible for as long as possible.